My second layout was built mainly with automated train operation in mind. I also wanted it to be an improvement on my first effort, Briargate. - Stick to TT, a perfect size, neither too big nor too small. - Automation, at least of trains running round the main line. This would provide a perfect opportunity to combine my interests in model railways and computers and – if I ever got to exhibit the layout – release me from continuous manual operation. - Lightest possible construction for portability. - Avoidance of as many constructional chores as possible (it’s supposed to be fun after all). 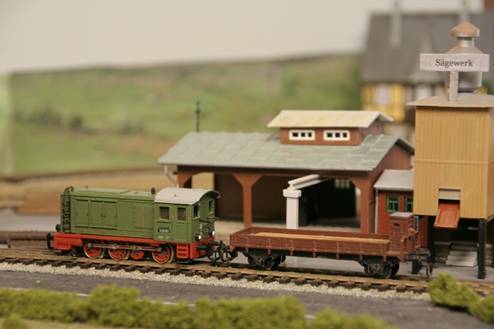 - Possibly build two layouts in one, with continental 1:120 and British 1:100 trains and buildings interchangeable on 12mm gauge track. I wanted to get something up and running fairly quickly and wanted a bit of a change from British trains. I also wanted something that ran reliably when automated, so I bought two brand new continental TT locos, including the Piko Taurus, to supplement three second-hand ones I already had. The second-hand ones run very well, and the new ones are even better. 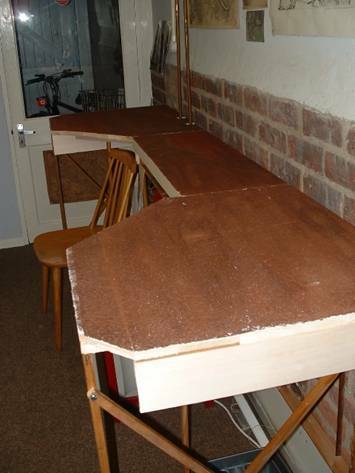 As I wanted a layout as light as possible for easy dismantling and carrying, I decided to forgo the conventional chipboard and two by one, and went for balsa baseboards covered with polystyrene sheet and supported by lightweight ¾ in. square legs. Hence the cunning name of the layout, though it doesn’t sound as good when translated into something European. Any ideas, anyone? Balsa is extremely easy to drill, cut and saw (but did you know it’s classed as a hardwood?) The downside is of course robustness. Balsa is remarkably strong for its weight but the layout would probably have crumpled if a large person had leaned heavily on it or blown away if someone had switched on a hair dryer at full blast. Balsa is also a little expensive. It cost £77.50 for about 23 square feet in pieces 4in. wide and 3/4in. thick. The layout was about 8 feet long and 27 inches wide at the ends. It was made in three sections, joined by wooden dowels and a couple of bolts, for fitting in the back of a hatchback to carry to all those exhibitions I had in mind, that is, a) if I got asked and b) if I could ever be bothered to dismantle it. The trackbed was Green Scene ballast mat, which at least looks neat and tidy. Put simply, I hated the thought of ballasting in the “time-honoured way”, even though I hadn’t minded for my first layout. 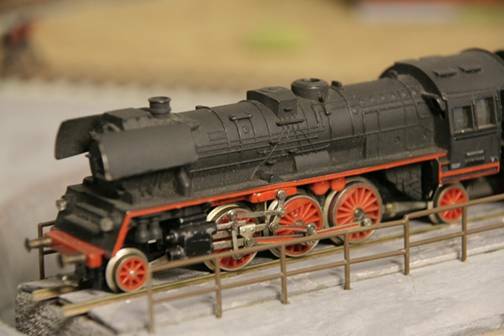 I must say I also dislike the look of much of the glued-on ballast I’ve seen at exhibitions; it can easily look old and tired (a bit like some of the exhibitors). “A model railway should look as if it has been built into the landscape and not the other way round”. Well, I’m sure those words of wisdom are right and proper, but I just designed the track plan, laid the track, sorted out the electrics then added the scenics. I don’t have the patience to do lots of carefully sculpted hills, trees and valleys, so my predominantly industrial layout is almost as flat as a pancake. But it does have a nice sprinkling of different shades of grassy earth. 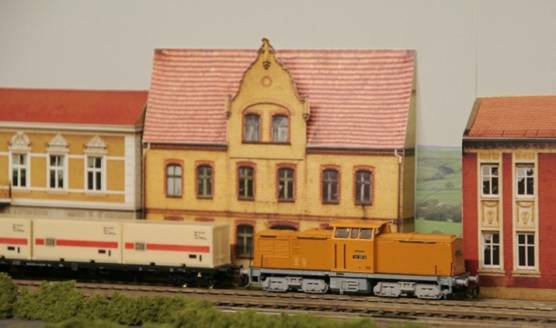 Auhagen have a feast of 1:120 and 1:100 scale building kits and scenic items. I ordered a selection direct from Germany via the Bettina Hohmann website (now defunct), but they can be bought from International Models. In fact, by the time you’ve paid postage and money transfer fees when ordering direct (and translated their emails from German), for a small premium you might just as well let IM take the strain. 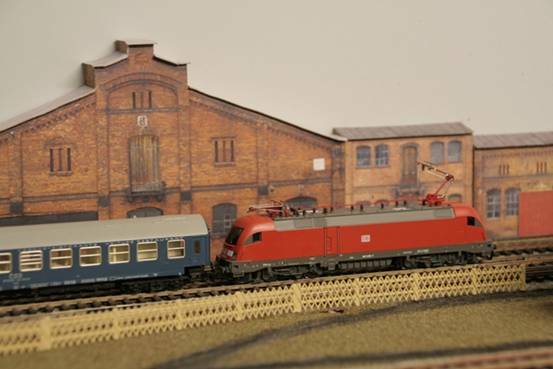 For the record, the kits I made are: two-road engine shed, Hagenau station, sawmill, loading bays, signal box, admin building, an old-style house and some half-relief warehouses and shops for the backscene. Ease of construction is another reason I used Peco flexitrack and points throughout (apart from a few lengths of 3mm Society track in sidings when I ran out). Laying this is a cinch, and the points are self-isolating and eliminate frog polarity wiring – though I unwittingly signed the death-knell for my Tri-ang wheels, which won’t go through the frog on the curved Peco turnouts. The track was fixed with N gauge track pins through tiny holes drilled into the sleepers at roughly six-inch intervals. The pins pressed very easily into the balsa beneath. I didn’t use any glue to fix the track so it could be taken up easily. Some of the track was angled or curved at baseboard joins, which you are strongly advised against – but I seem to have got away with it. What did prove to be a problem was the reverse curves incorporating curved turnouts – a recipe for derailments and I wasn’t disappointed. Electrics is one aspect of railway modelling I’m perfectly happy with so you won’t find any comments here to the effect that it’s some kind of black art best performed by the club warlock. There are eleven track sections. The layout of the sidings and position of the baseboard joins dictated six main feeds, with the points providing some of the isolation needed. Contact between the baseboard and control panel was via plug-together terminal blocks. I decided on a simple colour code for the wiring: blue for track feed, brown for track return, and white for turnout motors and loco sensors. There were 13 sets of Peco electrofrog points, four of them motorised with either Seep or Peco point motors and computer-operated. The rest were operated by piano wire bent at a right angle under the baseboard and stuck into the ends of wooden dowels for push-pull operation from the front of the layout. After researching a number of options, I bought electronic hardware and software components from US-based CTI Electronics. When connected to a PC or laptop, these enable automatic train detection, throttle control, block control and turnout and signal operation. My requirements were simple (though from the messy wiring you might not think so) – the operation of up to three trains alternately around a main line continuous run, with intermittent station stops, using two run-round loops. This involved some programming but as this used to be my job it wasn’t a problem. The program controlled four turnout motors and detected the position of the currently running train by means of four suitably placed sensors between the rails. I built in a manual override for the main line just in case of mishaps. 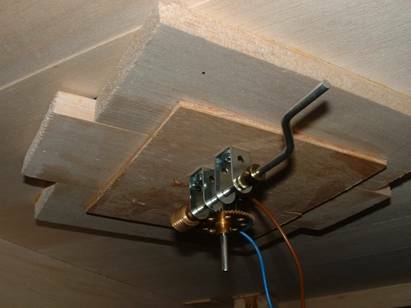 The turntable deck was made of balsa with plastic handrails, and manually operated from underneath by a Meccano handle and gear mechanism. 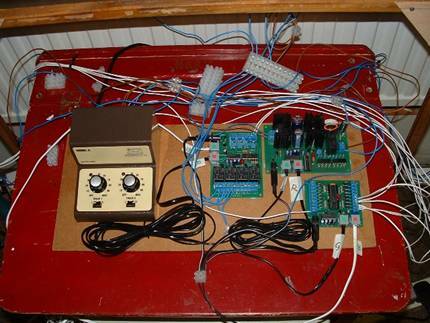 I had plans to motorise it and automate it with CTI…but the layout didn’t last long enough. These were made from plastikard ramps operated from underneath by Slippery Sid, a flexible wire-in-tube arrangement. I wanted something compatible with both Tri-ang and Tillig couplings and these worked very well. Generally I’m happy to sit and watch a nice rake of coaches or wagons glide round the main line. But with a station, engine shed, sawmill, loading bays, turntable, goods sidings, two passing loops and headshunt, all worked by five locos, there must have been a lot going on while I wasn’t there. I kept the track plan fairly simple and stuck (almost) to one type of track and live frog points, in my view the simplest to install and operate. But as already mentioned, reverse curves incorporating curved turnouts are not a good idea. And although Balsa is remarkably sturdy and easy to work with, it doesn’t take kindly to screws. I pretty well completed the continental layout, but never got round to exhibiting it or doing the British counterpart. The main problem was that I had to keep dismantling the layout because it was right in the gangway in our “play room” for passing between the front and back of the house and this turned out to be a bigger problem than I had expected. I had nowhere else to put it so eventually it had to go. It’s a pity because it was done in such a way that I could easily have substituted British 3mm scale buildings and trains, together with an alternative backscene. But there’s always the next layout.